The unique Calvin dining set puts a twist on contemporary dining. 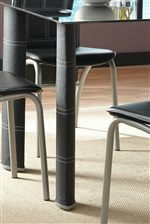 The table features a tempered black glass top that rests on oval legs covered in a leather-like upholstery. 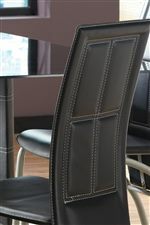 Upholstered side chairs complement the table's legs, with detailing like contrast stitching around thick panels. Extended chair backs and sloped metal legs give the chairs a unique silhouette. The result is a sleek, modern look that is distinctly new and fresh. The Calvin 5 Piece Dining Set with Upholstered Chairs by Steve Silver at Walker's Furniture in the Spokane, Kennewick, Tri-Cities, Wenatchee, Coeur D’Alene, Yakima, Walla Walla, Umatilla, Moses Lake area. Product availability may vary. Contact us for the most current availability on this product. The Calvin collection is a great option if you are looking for Contemporary furniture in the Spokane, Kennewick, Tri-Cities, Wenatchee, Coeur D’Alene, Yakima, Walla Walla, Umatilla, Moses Lake area. Browse other items in the Calvin collection from Walker's Furniture in the Spokane, Kennewick, Tri-Cities, Wenatchee, Coeur D’Alene, Yakima, Walla Walla, Umatilla, Moses Lake area.